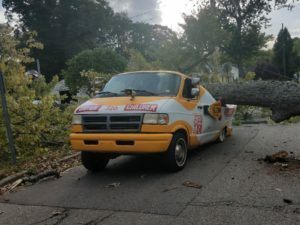 On October 07, 2017, at approximately 5:30 P.M., the Kalamazoo Department of Public Safety responded to the area of Springmont and Barnard regarding a tree that fell across a vehicle. Upon arrival it was discovered that large tree had been blown over and fell onto an ice cream truck. The vehicles driver was inside the rear portion of the ice cream truck getting ice cream from a cooler. He was serving two younger females who were standing on the passenger side of the ice cream truck. As he was reaching into the cooler, a very large tree crashed down onto the top of the truck, knocking him and the two girls to the ground. The driver was momentarily pinned between the roof and floor of the truck. He was able to self extricate and was later assisted out of the passenger side window. Fortunately, all parties only received minor injuries. The tree also took down power lines knocking out power to homes in the area. Consumer’s Energy is working on restoring power to the effected residences.